You will absolutely love this Easy Cream Cheese Frosting! It’s sweet, creamy, and of course easy to make! It’s divine spread on cupcakes, in between layers of cake (especially carrot cake), and on top of cookies. 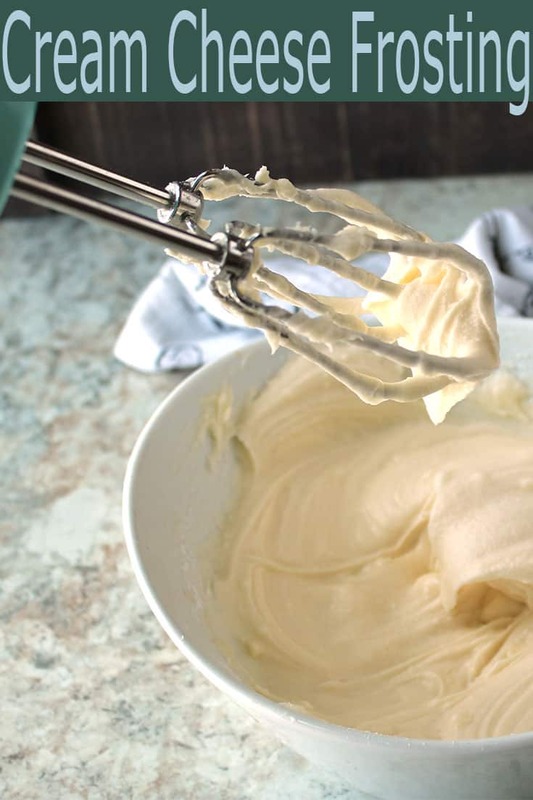 Our Favorite Frosting is this Easy Cream Cheese Frosting Recipe! Yes, Easy Cream Cheese Frosting is our favorite frosting. You know, there is just something about this cream cheese frosting. 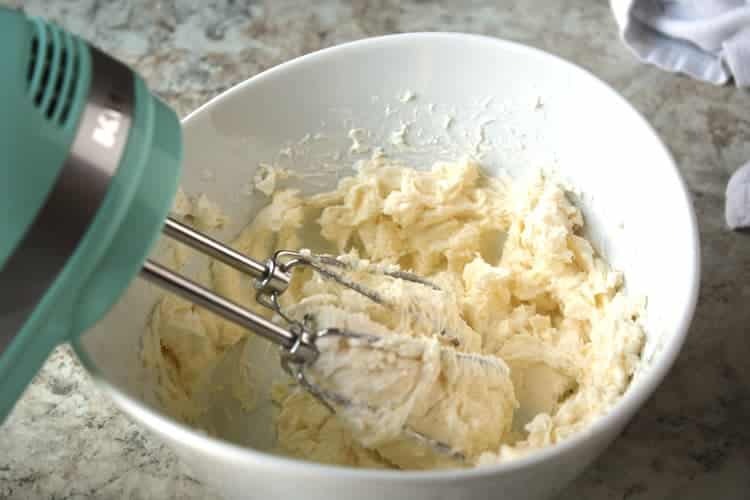 Of course, we love our Chocolate Butter Cream Frosting too, but we especially LOVE our sweet Easy Cream Cheese Frosting recipe. It’s kind of like a fun accessory. We like to dress our cakes and cookies up, style them out with fun flare and novelties. And then, of course…we like to eat them. But there is just something about food presentation that captivates us and for whatever reason, we want that food to look its best before we dive in and take a bite. I know that’s how I feel about any dessert I make, whether it is a Chocolate Trifle, my favorite Lemon Poppy Seed Icebox Cake, or even a simple Berry Chocolate Chip Parfait. When you take a bite of the delectable sweetness of Easy Cream Cheese Frosting, you’ll get it. You’ll understand how this is the frosting that is meant to be on every cupcake, pumpkin cookie, carrot cake, and spice cupcake that you make. This sweet flavor mixed with the tantalizing taste of a baked good that is moist and equally delicious — well, that is a mouthful to savor and that you won’t want to miss. We especially love Easy Cream Cheese Frosting on carrot cake (in particular The Best Carrot Cake Recipe) and every other spice cake imaginable. It always gets an Oh. My. Yum. reaction. Every single time. 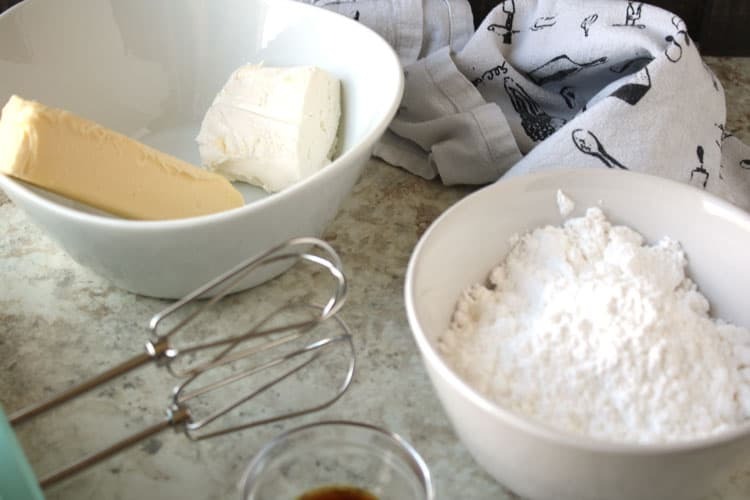 The thing to remember when you’re getting ready to make this Easy Cream Cheese Frosting is that there is nothing to it. 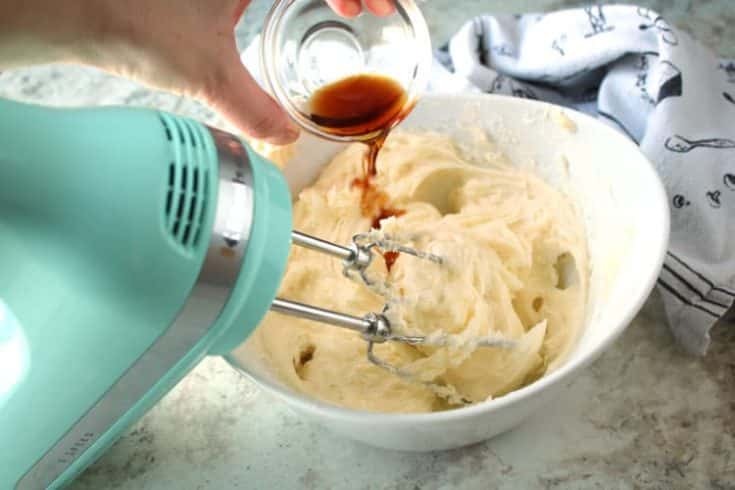 Grab your mixer (we’re partial to our KitchenAid hand held mixer) and get to mixing. This frosting comes together so easily, and the taste is spectacular! Once you’re finished mixing up the frosting, you can either use a simple Ziploc bag to act as a decorating bag, or you can pull out your frosting tips and get creative! This is seriously so easy… and we’re going to walk you through the steps. To start, get out your ingredients: cream cheese (of course! ), butter, powdered sugar, and vanilla. 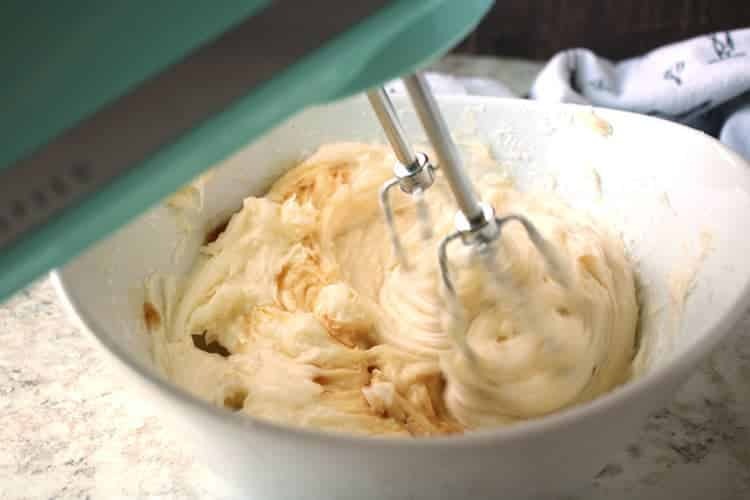 Using a mixer, mix the butter and cream cheese until they’re well blended and lump-free. … and slowly add powdered sugar while mixing on low speed. Tip: If necessary, you can add additional powdered sugar to reach your desired consistency. That is it! Your Easy Cream Cheese Frosting is done. 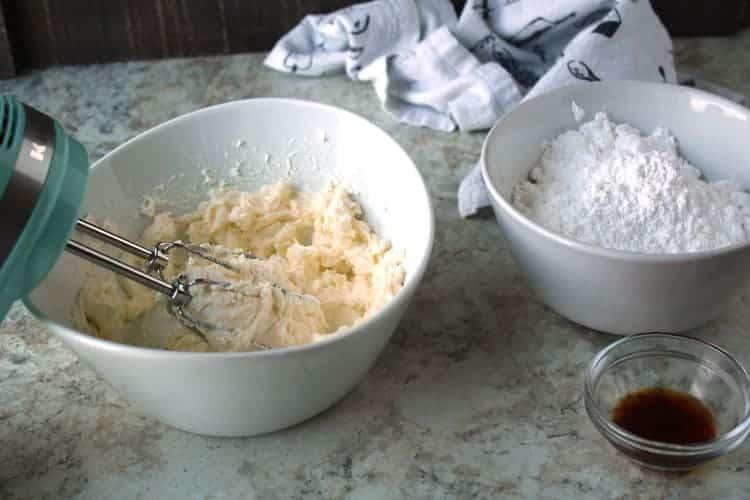 No matter how you decide to use this cream cheese frosting, we’re pretty sure you’re going to love each and every bite. When we top The Best Carrot Cake Recipe (or cupcakes!) with this cream cheese frosting, it is hard to stop at just one tasty treat! This frosting is sweet, creamy, and easy to make! Mix butter and cream cheese until well blended and no lumps. Add vanilla, mix and then slowly add powdered sugar on low speed. Add additional powdered sugar if needed to reach the consistency you are looking for.